Close up of a pivotal point on Point Roadknight looking toward the ocean. At this marker on the saddle of Point Roadknight which is about half way along its spiny ridge I noticed changes. Last year I observed traces of where high tide markers remained after the tide receded, seaweed pitched up by the tide reached the top of the saddle where small circular shapes in the sand remained as traces of small eddies of water. 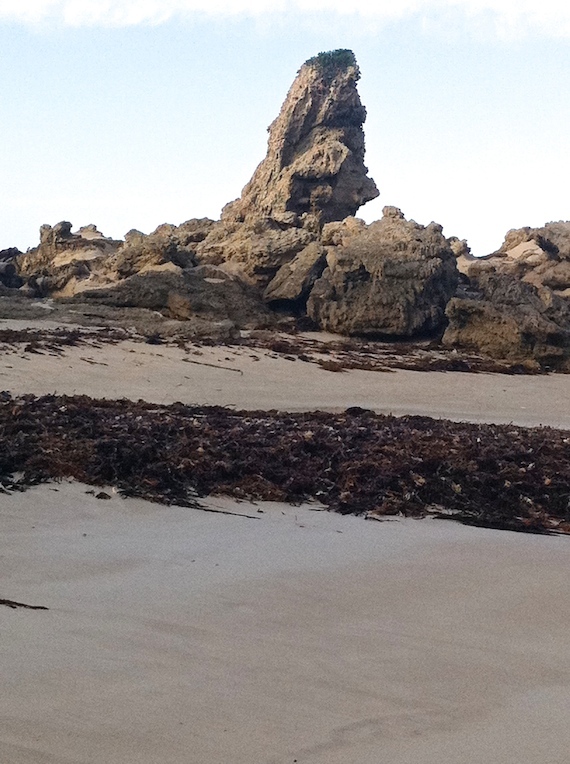 The image above shows a large and distinct seaweed ‘necklace’ that washed over the saddle and around the vertical rock form from the ocean side into the bay area. The images below however reveal distinct channels of erosion visible around this pinnacle as I stood with my back to the ocean looking toward the bay, showing in the last image from this series, the view of the ‘necklace’ and the bay. Within the series of images below are depicted the reverse where I am facing the ocean with my back toward Point Roadknight bay. The presence of a heavy log as a pointer could bear testament to the force of the waves as they breached the saddle. Categories: Preliminary photographs | Tags: landform, photography, Point Roadknight, sea erosion | Permalink. I would like to introduce Lee Powell to viewers. 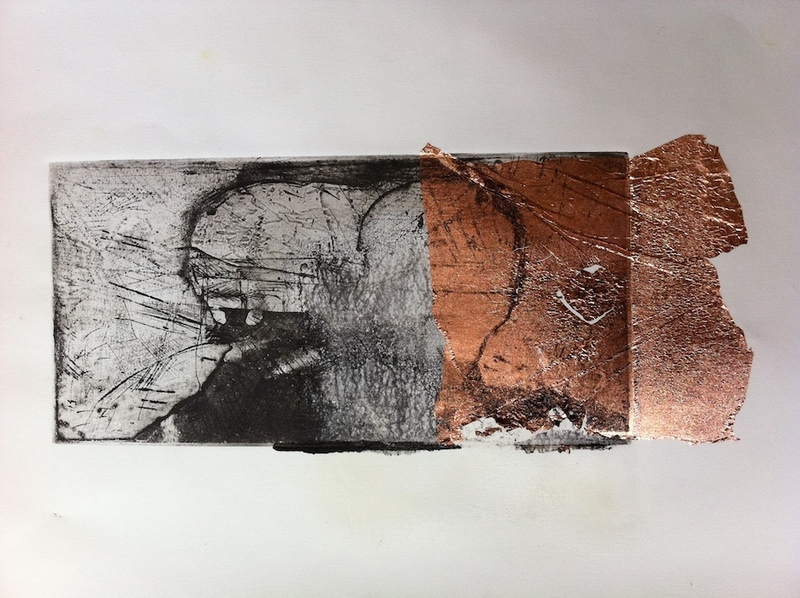 Lee, our tutor at the Anglesea Art House has introduced several contemporary printmaking techniques that include etching using a gelatine plate and experimentation with metallic leaf where she combines a decoupage approach to sculptural construction. This approach is where the application of printed papers to different objects produce a sculptural quality. The technique termed decoupage is similar to collage, that is, applying cut out pieces of paper and tissue to a surface that can also be two-dimensional. In the first image and slide show, Lee constructed an open box that while containing a series of connected fold out images also functioned as a frame when the images retracted into a single image. In the second piece of artwork the opacity and shiny surface of copper leaf was visible but not over powering through the semi transparent multi layerings of thin tissue paper and Hoshu paper. As the plate is gelatine (water and gelatine set when placed in a lined flattish baking dish or similar container) the artist does not require an etching press and simply flattens the paper receiving the print by hand. Objects such as plant material, seaweed or fine filigree textures and any shape desired adhere to the gelatine ‘plate’ over which colour is rolled.
. the copper leaf shows up through the over layering and harmonises with the yellow and brown in this landscape. 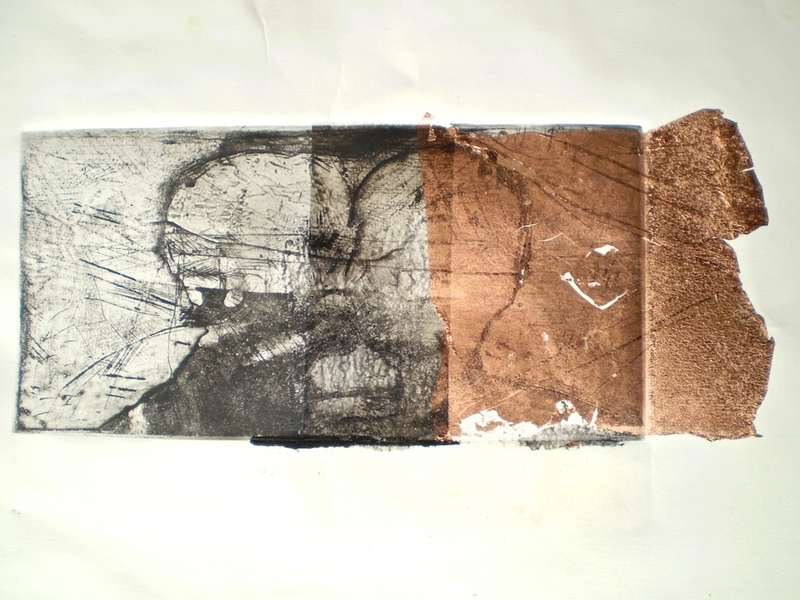 The term analogue art perhaps describes the artwork produced by our group because as demonstrated by Lee’s influence, truth to materials, the love of handmade papers, experimentations with inks and their application as well as mark making are central to her practice. 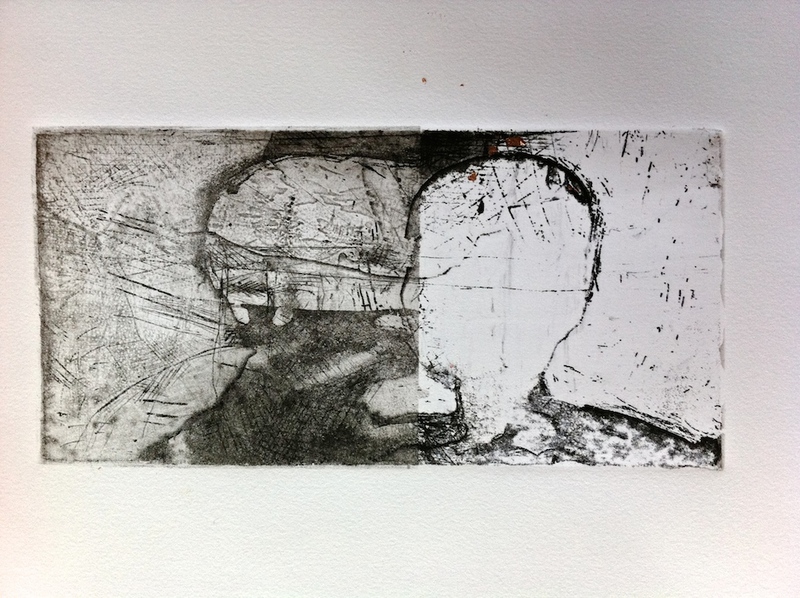 Categories: Etching, Mixed Media | Tags: Etching, gelatine prints, Lee Powell | Permalink. 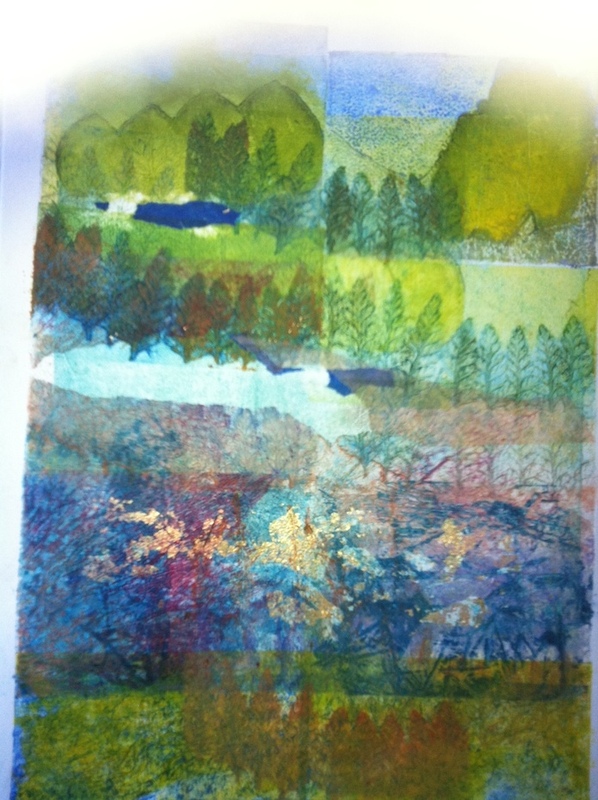 In my last blog I described various attempts at tackling copper leaf combined with intaglio. I thought that the process would be similar to applying chine colle to the image. However it was quite a tricky process handling the elusive leaf and its adherence to the the paper. 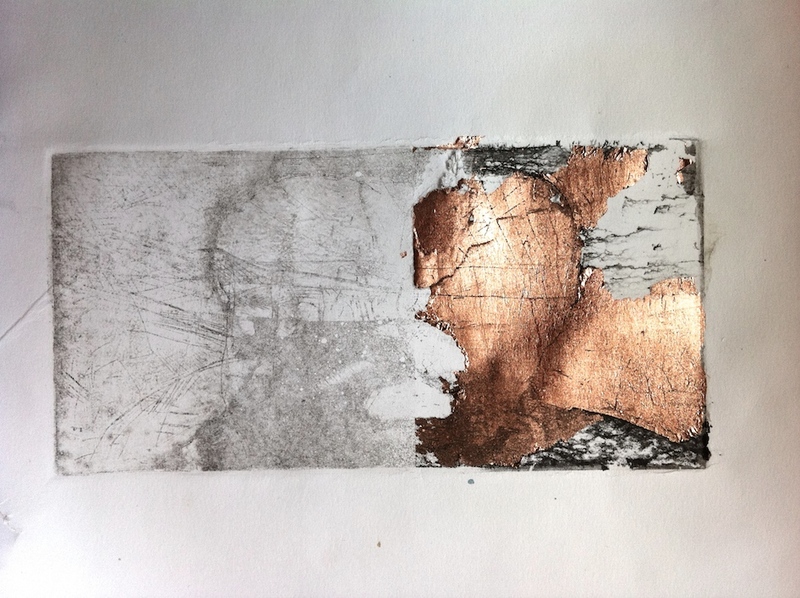 At first the metallic copper leaf adhered to the zinc plate and so I had to make sure that it stuck and dried to the printmaking paper before printing onto its surface. 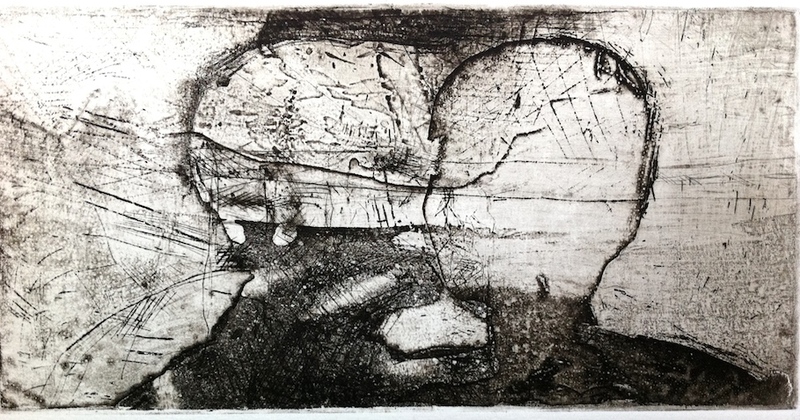 However a chine colle process would have been successful if the plate was a non – metallic collagraph. 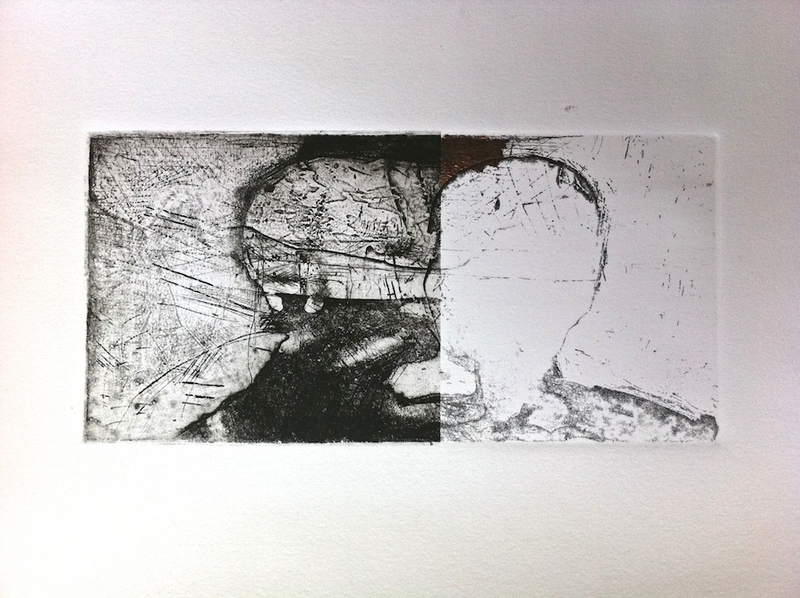 The etched section of the second image was a ghost print. The third image began as a mis-print because I had misjudged the register. I masked out most of the image and printed in the top right hand corner. l ‘m not to sure about the last image but I was surprised at how the combination of etching and copper leaf produced an antique look that reminded me of maps from the sixteenth century, as though the shapes resembled fragments of lost continents. All the imperfections; torn edges, edges over lapping the plate embossed edge, decal and excess ink bleeding outside its boundary could have resembled an old parchment that may have been in an attic for a few centuries. 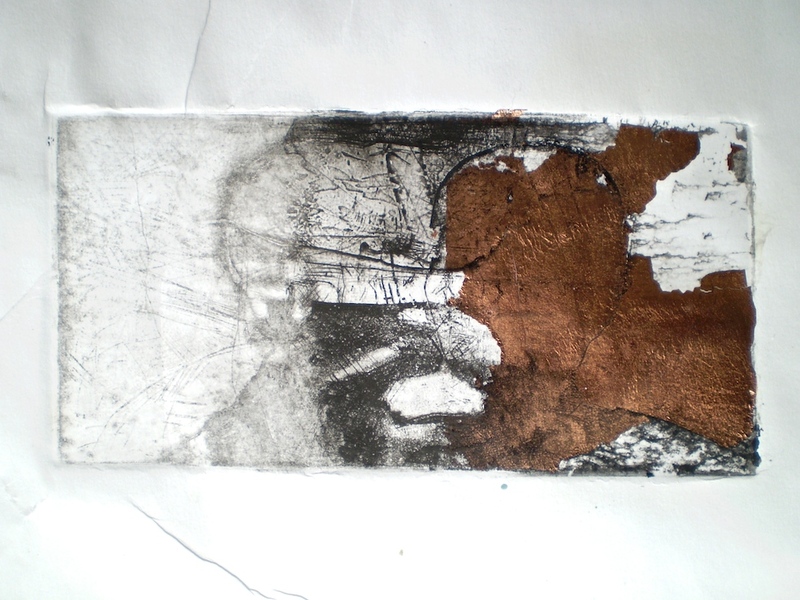 Categories: Etching | Tags: BFK Rives paper, copper leaf, Etching | Permalink. I would like to introduce Jill Giles and one of her artworks. 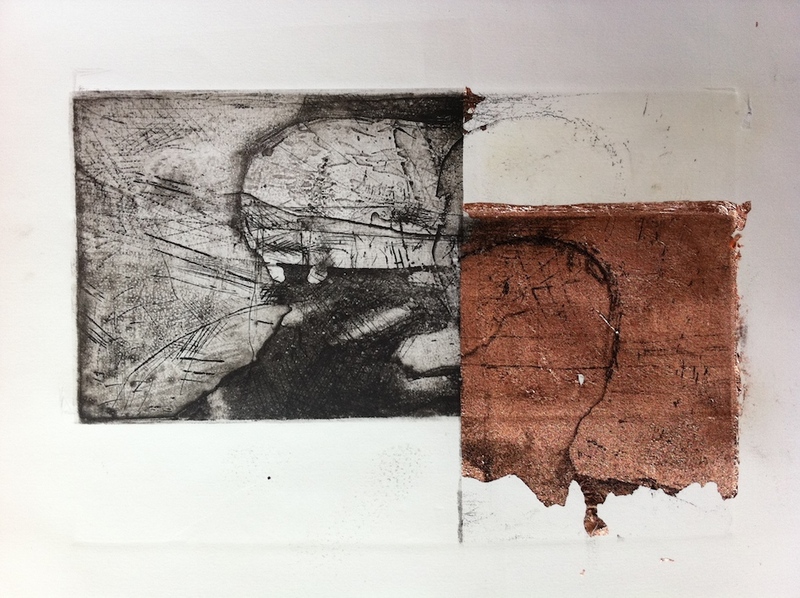 We are fellow printmaker at the Anglesea Art House and when she experimented with plaster of paris on perspex to form a collagraph, that is the combination of relief and intaglio on a single surface, we all took notice. The first image is one of the plate from which the print is taken and the second is the first proof that is a guide to how the image can be altered or improved. After taking this proof Jill added lines to the plate using metallic paint that may print in second proof as an embossed part of the texture. 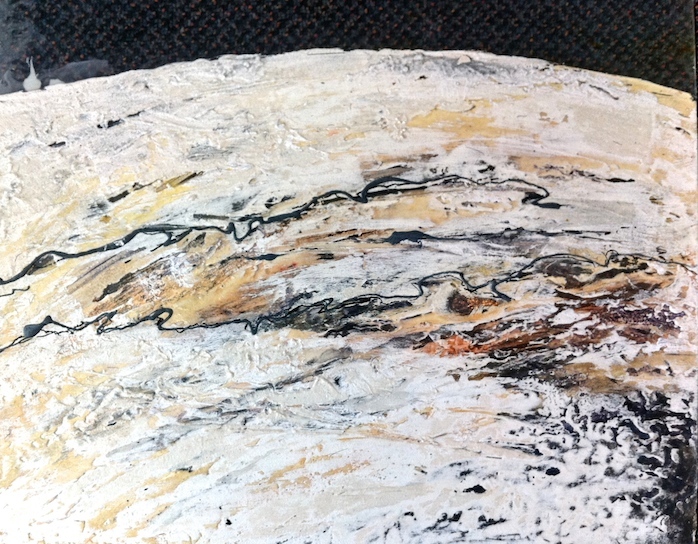 However as we were working away and Jill pulled this first proof I was excited by how well she had captured an aerial view of Lake Eyre as it dried out. We all got a buzz. 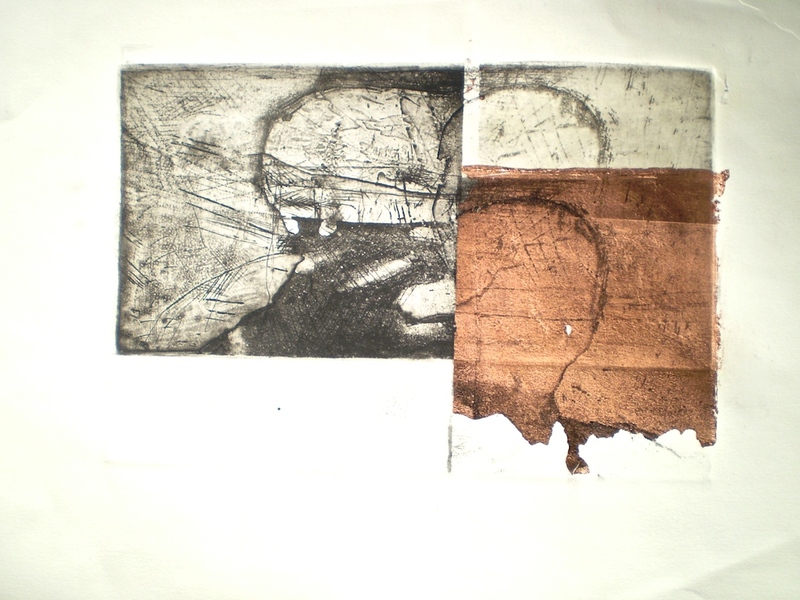 Collagraph is perhaps the most versatile of printmaking surfaces and its hard to know where to start but this technique gives an immediate, tactile way in. A perspex surface is often used for drypoint mark making with implements or by using an electric drill strong enough to gouge or scratch into the hard perspex surface. In particular this plate on perspex is constructed using plaster of Paris which lends itself to creating geological, organic textures. Looking forward to the next stage. 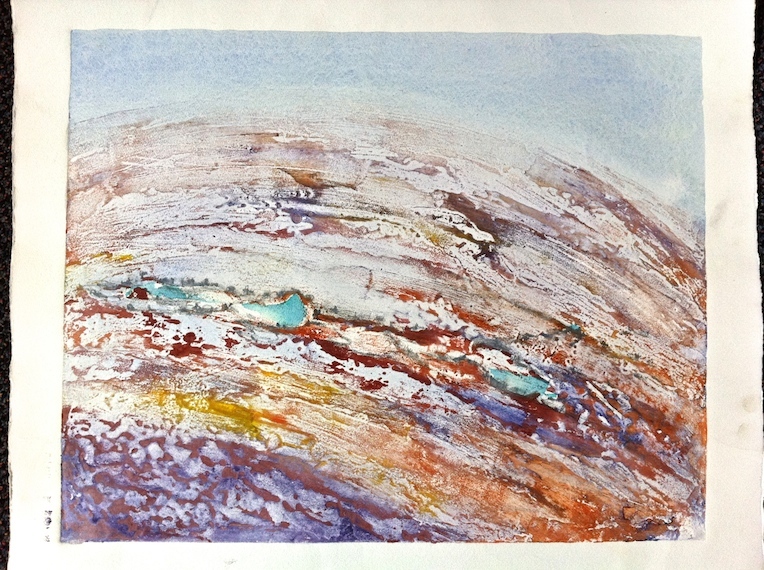 Categories: Collagraph | Tags: collograph, Jill Giles, Lake Eyre, printmaking | Permalink.